When I lived in Charlottesville, I used to love exploring around the fringes of the town on the Rivanna Trail. On one occasion I was scouting out my next jogging route and noticed a huge, mysterious house through the woods on top of the hill behind the University of Virginia (UVA) campus. I asked around and no one seemed to know who lived there or whether it had any connection to the rest of the town. Even on Google Maps, it somehow reminded me of the kind of place Scooby Doo and the gang would encounter a spooky monster. The process of learning more about the idiosyncrasies of our local surroundings is such a delight. It reminds me of William Blake’s poem, “To see a world in a grain of sand…”. I hope the folks living there don’t mind my curiosity. I would not wish for anyone to intrude upon their personal sanctuary. However, such an impressive structure, in such an unusual location, deserves to have its story told. I had no trouble parking on Water Street near Jack’s Boathouse even though there were a ton of other people out shopping in Georgetown.If coming across the Key Bridge turn on M Street going east then right on Wisconsin Ave.
From there I rode down the street to the Rock Creek trail which basically runs parallel to Rock Creek Parkway. It was narrow and crowded with pedestrians at first but after ~2 miles there wasn’t any problem. Beach Drive through the park is closed on Sundays to cars, so it’s ideal for biking. I followed it all the way to Maryland. Beach Dr turns into Jones Mill Rd. after crossing East West Hwy. I followed it to the intersection with Jones Bridge Rd. and turned left (South/West) onto Georgetown Branch Trail/ Capital Crescent Trail. Up to this point, the trail was paved and relatively flat with a slight uphill trend. After going through a giant tunnel, it empties out right in the middle of Bethesda row. You have to go across a tricky intersection but then the trail starts up again with pavement and is basically downhill the whole rest of the way. You can then follow the Capital Crescent all the way back to Georgetown. It runs parallel to the C&O for the last several miles. I think the total distance is a little less than 20 miles and it took me about 1.5 hours. You could also do the loop in reverse, in which case it would be a long gradual uphill for the first half and then a slightly hilly flat/downhill the second half. 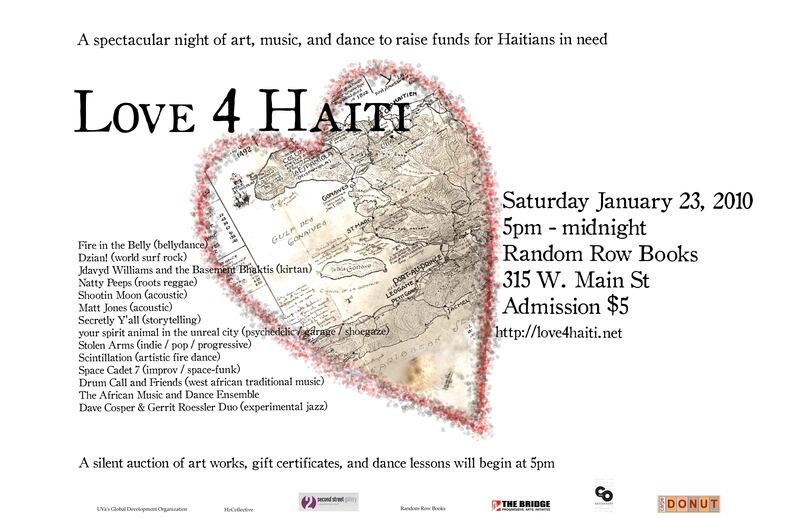 If you live in or near Charlottesville, come to the Haiti Earthquake Relief concert event this Saturday! Performers include Taiwanese surf rock band “Dzian!” and a host of others. For more details, see the official press release, or see the facebook event page. And, if you have doubts about whether this will really make a difference, consider that even critics of long-term foreign aid such as Dr. William Easterly and Dambisa Moyo are advocating for immediate relief (according to the New York Times’ Nicholas Kristof). Furthermore, cash makes a bigger impact than donations of physical goods or volunteering in a crisis of this kind.